I have a cheapskate’s confession to make. I like nice stuff and the BenchCrafted hardware epitomizes nice stuff. So I took a hard look at their Moxon hardware. Way out of my budget, but awesome and fast acting. I would gladly own it if I could. My hand joinery is where I need work and practice and so a Moxon was a must have accessory in my mind. I actually saw some things about the BC hardware that I didn’t like. I am clumsy enough to constantly run into the protruding threads and I felt that I would like to have a bit more jaw capacity than the BC allowed. This led to me tooking at other hardware that placed the threads behind the vise and I really loved the Bench on Bench designs because I could also have a portable workbench as a bonus. The hardware just seemed to be the obstacle. I really wanted the smooth and fast action of the BC! In fact, it became a “must have.” So what made it fast and smooth? 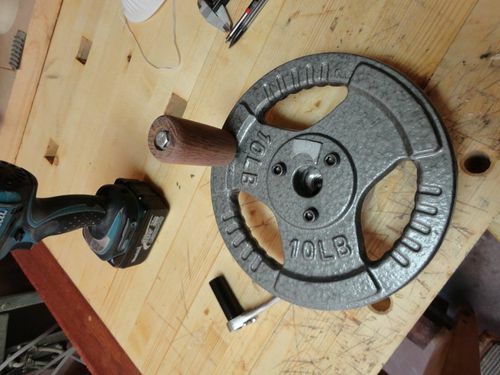 I decided that I needed single digit TPI and a relatively heavy handwheel to act as a flywheel. I had some one inch threaded rod and at 8 tpi that seemed like a good start, but what about the handwheels? My “AHA!” moment came in the sporting goods section at Walmart. I looked down and saw Gold’s Gym 2.5 lb steel weights for around $2. I seemed to remember, from a time when it mattered to me, that these went on a 1 inch bar! I took them home and had the makings of my hardware. After carefully welding them perfectly square to the threaded rod I was set. The top is made from a scrap piece of beech counter top from a GC friend of mine (I would have laminated recycled/salvaged timber if I didn’t have the beech) and the base is from trash picked plywood and covered in Cherry Veneer (my first veneering attempt… glad it’s a shop project). Glued to the base is a simple platform of ash so that the holdfasts have a sold purchase and I can quickly index the vise to the apron of the bench. The size of the base plywood boxes was determined by the 1 inch nuts which are wedged and epoxied into them. I love how the threaded rod is completely hidden by the base. It will hold a 15 inch carcass between the rods. WONDERFUL, in caps! well done! beautiful. Very nice! Great idea with the weights. Great to not see any threaded rods protruding. Compact. Inexpensive. Super project! I envy your welding abilities. As someone who made a similar moxon vise on the cheap, I say well done! I agree have been using these weights for years along with Acme rod . You did a great job on this and itwill be a wonderful addition to your shop. Also envy your welding skills. I need to get some. Nicely done. I figure I can adapt that to a design without welding, maybe with a drilled keyway. Thanks for all the compliments guys. Kiefer I have followed your projects for awhile, even subscribed to your YouTube channel! Subliminally I may have channeled your project into mine! LOL, Who knows? Thanks for subscribing Tim ! The idea is to spread information among us to give us less expensive option to make your own tools and keep it affordable .